Late, to favour the concentration of grapes’ content. Merago is a full-bodied red wine, with very intense perfumes of berries, sour cherry and ripe red fruits. An impenetrable red colour and its sensorial properties make it a wine of strong personality, to be paired with meat and cheeses based menus. 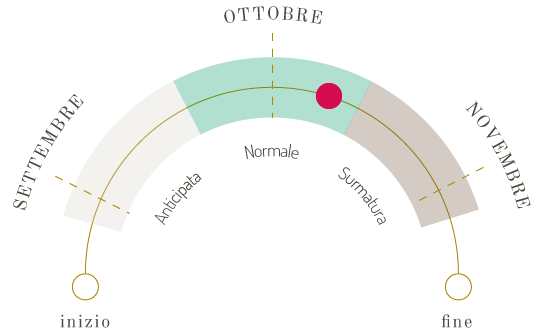 Merago is produced in the inland of central Le Marche on a deep soil of mixed consistency, with southeast exposure. “Vinification” occurs through long macerations to stimulate the separation of substances and a subsequent twelve-month period of refinement in big italic oak barrels, followed by 18 to 24 months in bottle. Perfume: Intense smell of red fruits, such as raspberry, blackberry, sour cherry, spiced notes of black pepper and cocoa. Flavour: Harmonious, highly structured, soft, warm, with sweet and mellow tannins, very persistent with a pleasant aftertaste of ripe red fruit. Wines produced from this type of late harvest will surely be full-bodied, sweeter and enhanced in their softness and structure.